On Wednesday 13th March, Felicity Keats, accompanied by Ndiphile Gule of umSinsi Press, ran a training in right brain methods of creative writing for 49 teachers. This took place at Drakensview Primary School in Estcourt. This large and highly successful training was organised by Penny Paterson, HOD, at Drakensview Primary. 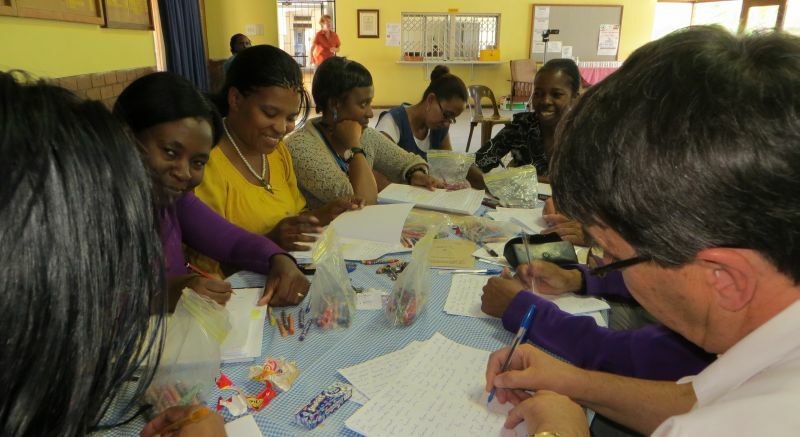 It included interested teachers from Bergville, Colenso, Ladysmith and Estcourt. By going through the process themselves of unlocking the powers of the right brain, then learning to write atmosphere and story from a right brain perspective they discovered talents they didn’t know they had and gained a new experience. There was great glee amongst teachers who suddenly discovered the ability to write lively stories. A few teachers admitted that their left brains were giving them a lot of trouble by not wanting to give up the control they had over their right brains. Shifting from the left brain to the right brain results in the breaking of “boxes” along with a paradigm shift from one’s comfort zone to an area where teachers discovered new skills of fluently writing publishable work. Advantages for teachers taking this knowledge back to the schools are excellent discipline amongst the learners, and for teachers, a reduced marking load and no lesson preparation for creative writing as teachers received a pack of three books that covered all grades from R to matric.